Links, in all honesty, are the Internet’s backbone. Consider a search engine crawling through the complex metropolis that is the web. What are links for it, if not the pathway to your pages? Using sophisticated link building strategies can, therefore, help the crawler discover your pages, and eventually rank them higher. While it’s true that links aren’t everything in SEO, but experts attribute a large portion of the search engines’ algorithms to link-related factors. Using links, engines are not only able to analyze your website’s popularity, but also measure various metrics like spam, authority, and trust. For obvious reasons, trustworthy sites tend to link to other trusted sites. Spammy sites, on the other hand, will receive few links from trusted sources. This solidifies the claim that links are actually a good way of identifying the experts on a given subject. With the widespread popularity of the internet, it has become essential that a user gets precisely the kind of information and data that they’re looking for. Google understood this, and to this day, it keeps modifying the algorithm in order to present their users with the best possible results. This led them to measure the popularity of websites, which further brought about the revolution of the search engine. To further add to the revolution, the concept of backlinking was born. At the core of it is wanting to earn “inbound links”. For the uninitiated, incoming links are also known as inbound links and are created when one website links itself to another. In generic terms, if you make a website, it is likely to get lost in the vast pool of already existing websites. But, if you make sure to target the most popular websites in your space, you can be sure of attracting some of their traffic. This is precisely what link building is all about. Keep in mind that link building isn’t an easy task. To get it working for you is actually pretty hard. Which is exactly why most people seem to struggle to build links that redirect to their space, regardless of the tactic they employ. If that sounds like you, you might be in just the right place. We won’t talk about a bazillion link building strategies. What we’ll instead show you are a handful of link building strategies that are known to work. Don’t believe us just yet? One of the most used ways for enhancing SEO using link building is the Skyscraper Technique, which is considered ambrosia for content marketing. The technique suggests that one should find an authoritative site, a website that does really well, in the same subject that your website lies in. The easiest way to do this would be to search for keywords on Google and use tools like Ahrefs. This would help you establish a base for your website. The second step would be to build on the base, hence the name “Skyscraper”. To create linkable content, you must determine why certain pieces of content attract links. If you explore the internet a bit, you realize that the top link performers are mostly articles about weird, odd, whacky, or silly subjects, which seems befitting as our mundane lives can often consume us, and the only leeway seems to be sharing humorous content online. Another way of building on would be to check the kind of features that the most popular websites lack- like a sense of aesthetics. In this time and age, if your aesthetic is not on point, people tend to click out faster than Ned Stark’s death on Game of Thrones. Using that to your advantage can help you gain that popularity that you need. The third step would be to get the word out, announce to the world about your great website. The idea is to reach out to websites that link other blogs and websites. Strategically decide who to send emails to, and making sure that your email script is crisp and short, that would allow the receiver to understand and acknowledge your request in a short amount of time. 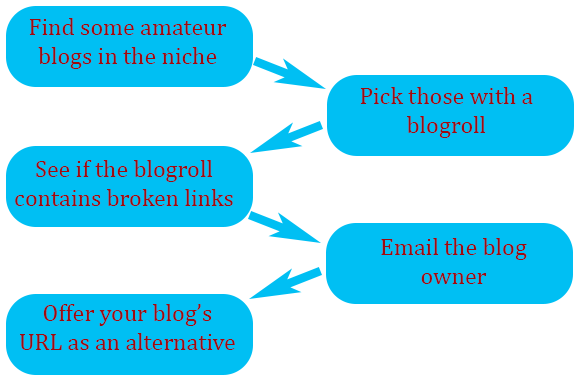 Another great way to build a backlink would be the most obvious exercise- guest blogging. When you watch your favorite blogger, or vlogger react to certain blog posts, websites, or videos, and how they tend to link the original content in their description box, that is also a form of building a backlink. This kind of exercise allows your content to reach a wider audience, whilst also getting more traffic on your original content, be it your website, or blog post. This new and improved way of molding the algorithm in your favor, is now heavily popular in the form of “collaboration”, as they call it. Yet another popular way of backlink building is the age-old technique of ‘broken link building’. This method can help you earn quick backlinks from high-quality pages. Broken link building technique is used to find broken links on a website, which share a common thread with your own website, and then emailing the content owner of the popular website, and notifying them about a broken link. Along with that, you can share a similar link from your website (similar content which you already have to create), and ask them to update their post. A form of backlinking is also called interbacklinking, which is when you use the links within the same platform. What this means is that if you refer to an old blog of yours (click on the link to see what we did there!) in any new writeup, you can link your users to the older blog. This is what interbacklinking is. As easy as it reads, it is extremely easy in practice, too. But that doesn’t take away the power of this tactic. It tends to be fruitful because you never know which piece of your blog, or what part of your website might gain popularity, and generate traffic on the backlink as well. If you create content which is fresh, has a little zest to it, and is most importantly shareable, then the aforementioned techniques will all work in your favor. In order to mould the system according to your needs, it is of utmost importance that you do not get lost in the idea of “if I create good content, I shall attract traffic”, because regardless of the quality of the content, if it is not available on a search engine on the first or the second page, it will get lost. Just think about it, do you, or anyone you know, scroll past all the results that Google offers you? Then honestly, it’s pretty unfair for you to believe your potential clients would do that. They’ll simply access the link that’s easily reachable to them. But now that you know what link building is all about and how to go about it, you’ll probably not face many challenges while ensuring that it’s your website that your potentials see first. And if you’re still confused and feel stuck, we’ve got you covered. Reach out to us, and we’ll get your links sorted!